A 45-year-old Dracut man is facing multiple charges after allegedly posing as a police officer, armed with a loaded gun, in Tyngsboro. Kevin Lessard was arrested by actual Tyngsboro Police and charged with misdemeanor impersonating a police officer, as well as felony charges for carrying a firearm without a license, unlawful possession of ammunition, and carrying a dangerous weapon. Lessard was arrested around 3:30 p.m. on Saturday. According to a police report, officers had received a report of a two cars parked near the Vesper Country Club, one of which had flashing lights. Lessard was found to be driving a Ford Crown Victoria, a vehicle used by many police departments as patrol cars. The second car, driven by a female, was disabled. 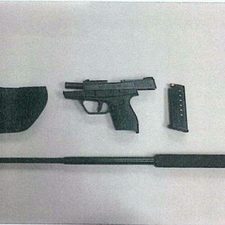 In addition to a loaded gun, Lessard also had a police baton. According to the report, he told the driver of the disabled car to stay in her car until a tow truck arrived. According to Howe, this may not be first time Lessard has impersonated a police officer and interacted with the public. He is asking anyone who recognizes Lessard and has had interaction with him to call the Tyngsboro Police Department.